Brides, let’s talk about your bride tribe, your ladies, the ones that will have your back through thick and thin, and the special women that will keep you sane regardless of how crazy the wedding planning gets. These women are going be there to take care of the last-minute details, hold the train of your dress, and they’ll be there to tell you how radiant you look right before you walk down the aisle. Your squad is an important part of your wedding, and they’re also going to be in all kinds of wedding photos on your big day, so when you choose the dresses for them to wear, you want to make sure that they’ll all look beautiful! We’ve seen so many different dress styles throughout the decades, puffy sleeves, lace, bright pink, you name it, it’s probably been worn. But, brides are starting to take on a new trend for their bridesmaids. Now, we’ve been seeing more mixed and matched bridal party gowns than ever before and when executed correctly, it looks gorgeous! This is the newest and latest trend that you should definitely try because it’s fun and gives your bridal party more options and variety. All you have to do is stick to one color family, or even mix and match with earth tones and neutral colors. Your bridesmaids can wear different styles of dresses and as long as they stick with the color you’re looking for, it’s bound to look gorgeous! Try sticking to either all short dresses or all long dresses to maintain a little bit of consistency among all of your bridesmaids. Don’t be afraid to mix up the textures as well! Throw in some lace dresses for an added vintage or bohemian vibe. You can even add in dresses with metallics like jewels or sequins for added sparkle and flair to your bridal party. Play with this trend by combining different patterns. You don't have to stick to one color, texture or pattern. You can be a little adventurous by having your brides wearing matching shades of colors and incorporating a different pattern in each dress. If you’re looking to break away from traditional bridal party looks, this is the trend for you. It’s a non-traditional way to make your bridal party stand out. Trying out this trend will mean less fuss from your bridesmaids. Let’s face it, sometimes it can feel impossible to find a dress that every bridesmaid is going to feel good in. That’s why choosing one dress for a whole party of bridesmaids can be so stressful! The good thing about this trend is that if you give your bridesmaids colors to choose from, they can either feel free to go shopping for their own dresses that match the shades you’ve given them, or you can pull a combination of dresses yourself that each of your bridesmaids can choose from. This way, it gives your squad options, while keeping with a theme and making you happy! You don’t have to buy insanely expensive dresses to pull off this look. Brides can find dresses from department stores like Macy’s where they’ll find lots of affordable options, and this way, they’ll probably end up purchasing a dress that they’ll get to wear again, which is something most bridesmaids weren’t able to say before this trend began.? Going for a relaxed and casual look? 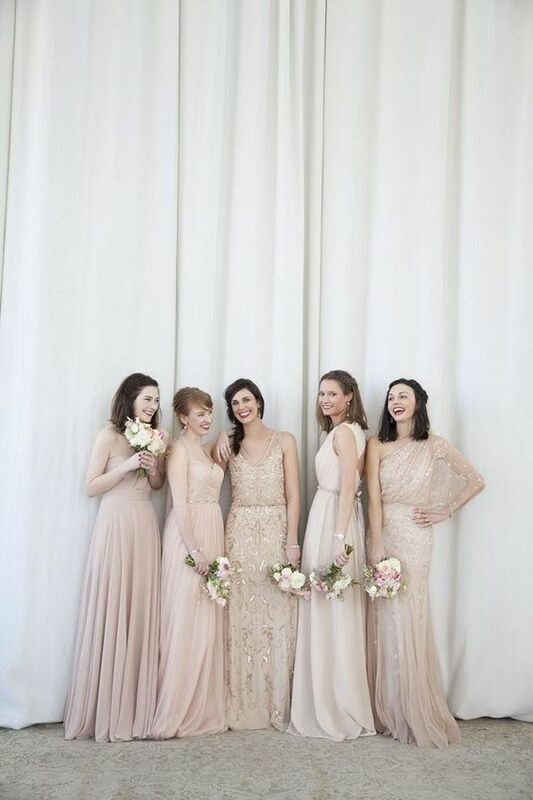 Mixing and matching beautiful maxi dresses in different shades of the same color can give your bridal party that relaxed, conventional feel that you’re looking for. 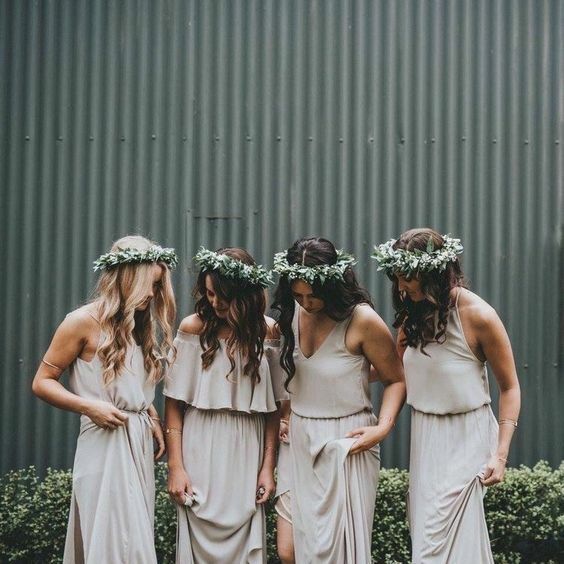 Overall, this trend is a fun and unique way for each bridesmaid to express her individual style, all the while having all of the dresses come together for a cohesive and beautiful look that flows together perfectly. Don't be afraid to be different and try something new! Combining colors, textures, and patterns can create beautiful results!